Gyarmat is a village in Győr-Moson-Sopron County in Hungary between the Town of Pápa (15 km north) and City of Győr (30 km south) in the Little Hungarian Plains. The settlement has got 1,455 inhabitants (1990 census), near all of them Hungarians. Neighbouring settlements are: Mórichida, Csíkvánd, Malomsok, Takácsi, Vaszar, Gecse, Szerecseny and Tét villages. The territory of the village is inhabited from the Stone Age. The first mention of the village is from 1267. Gyarmat has got its name from the name of one of the Hungarian Tribes (Gyarmat). All the settlers of the villages were serf. 1552-1593 and 1663-1685 under Turkish rule. In 1910 Gyarmat was a village in the Sokoróalja district of Győr County. Number of inhabitants in 1910: 1.627; 1.586 (97,5%) Hungarian, 39 (2,4%) German and 2 (0,1%) others by mother tongue, 1601 (98,1%) Roman Catholic, 17 (1,0%) Jew and 9 (0,9%) other by religion. 1920-1946 in Győr-Moson-Pozsony County, 1946-1949 in Győr-Moson County, 1950-1992 in Veszprém County and 1992-now in Győr-Moson-Sopron County. 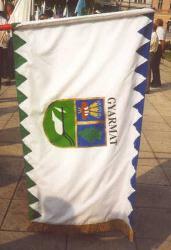 I took a photo of the flag on 17th August 2001 at "General County Meeting" in Győr .